Matchbox Cars were first made in England by Lesney Products & Co.. The company was founded by Rodney and Leslie Smith in England where they produced die-cast toys. They were called Matchbox cars because they were small enough to be carried around in a match box. The cars were known for their quality of detail and craftsmanship. The first Matchbox cars were made in 1953 and each year new cars were added, with some being replaced, until there were 75 cars (there were never more than models in each year’s line). The first four models were the Muir Hill Site Dumper, the Road Roller, the Massey Harris Tractor and the Cement Mixer. The cars were originally distributed by the Moko company and in 1956 Lesney started making the “Models of Yesteryear.” These were detailed cars of the past and came in the yellow Matchboxes. In 1982 Lesney Products began to develop severe financial problems. The company was forced into receivership and Matchbox Toys was sold to Universal Toys. 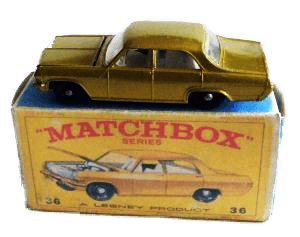 Universal later sold Matchbox Toys to Tyco in 1991 where the cars continue to be marketed today. Along with the cars, Matchbox also makes accessories, such as gas stations. While they are not as popular as they once were, collectors are still very passionate about the cars. Matchbox Cars remained a leader in the field of die-cast cars until it began losing market share in the late sixties. The main threat to that market share was Mattel’s Hot Wheels cars which entered the market in 1968. As they vied for market share, the Hot Wheels cars were designed with speed in mind and were marketed as such. The cars contained a special axle and wheel design that allowed them to travel much faster than their competitors. They also had a flashier, hipper design in order to appeal to the younger, cooler kids playing with them. Despite these fun qualities, what really set the Hot Wheels line apart were the accessories designed for the – most noteworthy the Hot Wheels tracks system. The tracks, made of bright orange slick plastic could be easily connected to create an entire racing course. Additionally track accessories added even more fun and competition to the races. The cars could pass through a battery operated suoer charger station which would rocket the cars out of the station and out along the tracks with enough force that they could make it all the way back around to the station (or to another station positioned somewhere along the course). Another accessory was the track connector which allowed the track to be connected into a loop de loop, send the into a 360 degree vertical rotation. As the line enjoyed more and more success, more and more variations of the cars appeared, accompanied by new accessories, including criss-cross tracks and a danger-filled volcano. The accessories allowed the children to build large scale models of a raceway, much like their father’s used to create elaborate structure with their Erector sets. By playing the role of racetrack designer and car owner, the children fulfilled two playtime fantasies at once. Eventually, the Hot Wheels line made its way into the electric slot car world adding even more capabilities and fun for the young car fans. The world of die-cast cars has grown and changed immensely over the years but the fondness for and loyalty to the cars has remained consistent and likely will for years to come.